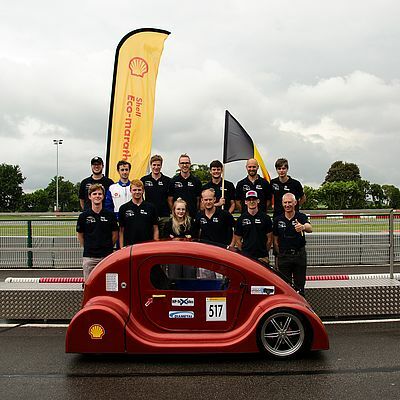 The Shell Eco Marathon asks student teams around the world to design, build, test and drive ultra-energy-efficient vehicles. Warner Electric has sponsored students at Thomas More University for their entry into the urban concept class. One of the biggest challenges for any automotive manufacturer is efficiency. No matter if a car is powered via internal combustion (ICE), a hybrid powertrain or a fully electric design, it is likely that its range between fill ups will be high on the list of customer priorities. This is why engineering challenges like the Shell Eco Marathon are so important, encouraging a new generation of engineers to pick up the mantle of automotive development. In particular, the Shell Eco Marathon is inclusive of all energy types, which is reflective of the modern mainstream automotive sector. Based in Belgium, Thomas More University of Applied Sciences is the perfect fit for the challenge and for the last eight years has entered a team of budding engineers. Originally, the teams focussed on the Prototype vehicle classification, which is a more conceptual challenge. However, for the last four years they have chosen to compete in the Urban Concept class, where the design must incorporate road legal performance alongside ultimate energy efficiency. One of the challenges for any student team is sourcing high quality components while operating to a tight budget. When looking for a suitable clutch to engage and disengage the engine from the drivetrain, the team approached Warner Electric, part of Altra Industrial Motion Corporation, for support. The SFM VAR 11 bearing-mounted clutch coupling from Warner Electric's range of shaft-mounted electro-magnetic clutches was identified as the best fit for the project. Available in seven different sizes, the smallest in the group (Size 10) delivers up to 7 Nm torque with a maximum speed of 8,000 rpm. At 12.5 volts and only 790 grams, the clutch is mounted to the shaft via a keyway design and integrated seamlessly with the car's lightweight design philosophy. Another of the popular Altra brands also supported the team's Shell Eco Marathon entry, proving the value of Altra's combined services. Stieber Clutch supplied the team with four CSK freewheel bearings for the wheel arrangements.